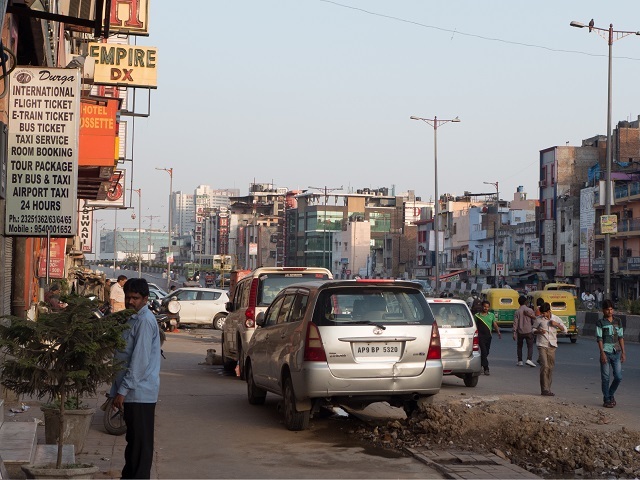 With 26 million inhabitants, Delhi’s metropolitan area is the fifth largest in the world. But the city also has terrible air quality, with an annual average particulate matter 15 times the recommendation of the World Health Organization. Air pollution is responsible for 10,000 to 30,000 annual premature deaths in Delhi, and is the fifth leading cause of premature death in India, with 620,000 deaths every year. This high level of harmful pollutants is a consequence of various problems with the city’s transport system. Most of the particles come from the tailpipe of motor vehicles and dust from traffic in unpaved or poorly maintained streets. Delhi has the largest vehicle fleet in India, with close to 7.5 million units. According to India’s Center for Science and the Environment, motor vehicles are the “Silent Killer” of Indian people. Delhi’s response to the poor air quality has been a series of policies. In 1996, the Supreme Court ordered sulfur content in diesel fuels be reduced from 1 percent to 0.05 percent by 2001. Then, in 1998 the Supreme Court ordered that all commercial vehicles (buses, taxis and three-wheeled “auto-rickshaws”) be converted to Compressed Natural Gas (CNG) by 2002. At the same time, strict emission standards were developed for all vehicles. Metro operations started in 2000, and the system has become one of the fastest growing urban rail networks in the world, with 213 kilometers (125 miles) carrying 2.4 million passengers per day. Delhi strategy was successful during the early years. 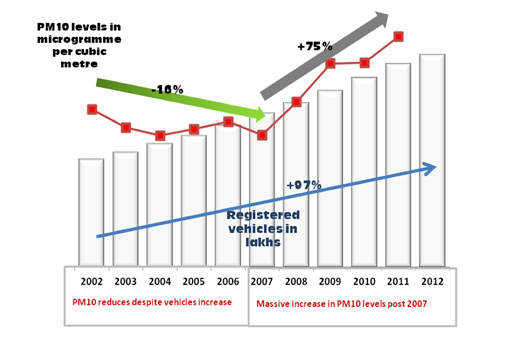 Particulate matter fell by 16 percent between 2002 and 2007, but it started to increase dramatically after 2007, as motorization and average trip lengths in the megacity grew as well. What went wrong? One plausible response is that the strategy was incomplete, not taking into account policies and decisions that promoted urban expansion to the surrounding states of Haryana and Upi. This included the large-scale expansion of the road network, expressways and flyovers, unrestricted ownership and use of motor vehicles, increase in the number of light duty diesel vehicles (SUVs) and growth in unsustainable fuel subsidies. As a result of the air quality crisis in 2015, the local government experimented with license plate restrictions, separating even-odd plate numbers during a 15 day trial period. It brought congestion relief, but did not reduce air pollution by much. One side effect of reduced congestion was faster bus rides for six million commuters. The experiment was repeated again in April 2016. These restrictions may seem useful in the short term, but do not solve the problem. So what else should the city do to reduce air pollution? Beijing, México and Bogotá’s experiences fighting air pollution can provide some clues. The Chinese capital has also faced very difficult challenges, but in 2015 its air quality registered at about one-third of Delhi’s PM2.5 level. This progress can be attributed to high investment in public transport (metro and buses), combined with transport demand management (TDM) measures. Bejing introduced plate restrictions during the Summer Olympic Games in 2006, and the city currently restricts 20 percent of the fleet according to plate numbers. In 2010, Beijing introduced a vehicle registration quota which distributes only 20,000 new licenses every month through a lottery system—reducing the number of vehicles permitted. Currently, city authorities are discussing the possibility of implementing a congestion charge. By the end of 2015, the city’s economy had continued to grow 6.9 percent. The air quality situation was promising, with stable concentrations compared to the previous two winters, but still 5 times the limits recommended by the WHO. Mexico City’s local government has been working to improve its air quality for more than three decades, focusing first on technology and then shifting to a focus on sustainable mobility. In the 1980s, the city ordered a reduction of the lead content in gasoline, closed a petrol refinery in the Valley of Mexico and relocated industries to the periphery. In 1989, it also introduced emission control standards for manufacturing firms and prepared an air quality plan, which included a reduction of the sulfur content in diesel as well as car restrictions. The air quality plan was accompanied by improvements to the public transport system and a greater focus on walking and cycling. The city expanded the Metro system (Line 12, 20 kilometers, 367 thousand passengers per day), built the Suburban Rail Buenavista-Cuatitlán (27 kilometers, 150,000 passengers per day) and implemented the Metrobús BRT system (125 kilometers, the most extensive BRT network in the Americas, moving one million passengers per day). Mexico City also launched and expanded a successful bike share system called Ecobici and a network of dedicated bicycle lanes. They also pedestrianized key streets downtown and introduced an on-street parking management system called Ecoparq. All this helped improve air quality while also improving access to mobility. 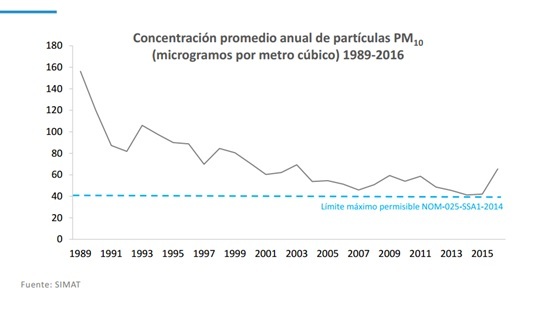 Particulate matter smaller than PM10 fell from an average of 160 µg/m3 in 1989 to 40 in 2014. Nevertheless, Mexico City’s air quality has recently taken a turn for the worse. On March 4, 2016 the city declared the first air quality contingency in 14 years. The crisis is the result of not advancing emission standards (México still keeps Euro IV standards), an aging fleet and delays in the plan to reduce sulfur content in diesel fuel. México, like Delhi, has also experienced rapid growth of its vehicle fleet—from three million in 2000 to close to nine million today. Urban expressways (“Segundo Piso” or second floor) have also expanded quickly. Exemptions to the “Hoy no Circula” policy on vehicle restrictions made it a very ineffective measure. Although vehicle ownership grew threefold, the plate restrictions ended up affecting only 3 percent of the vehicle fleet in 2016. However, with the recent air quality crisis, the city eliminated the exemptions and reinstated restrictions not only for cars but also motorcycles, including new vehicles. Fortunately, Mexican authorities are conscious that this is only an emergency response, and that the city will need to focus on sustainable mobility and transport demand management measures in the future. Bogotá has also shown progress in air quality management, but it still has not met the standard set by the WHO. As in Mexico, progress is the result of a mix of multiple measures focused not just on air quality, but on improving mobility in general for the city’s residents. Average levels of PM10 have declined from 100 µg/m3 in 2015 to 50 in 2015 (though still 2.5 times the WHO’s recommended average). The city has reduced sulfur content in diesel fuel, introduced traffic restrictions to trucks and buses and replaced public vehicles with newer technologies, including 428 hybrid electric buses. These measures reinforce steps that Bogota has taken since 1998: license plate restrictions (initially 40 percent of the fleet, now 50 percent in an even-odd scheme during peak hours), the construction of the BRT System TransMilenio (now 113 km long, serving 2.4 million passengers per day) and the implementation of an extensive bike network (now 410 kilometers long). Bicycle use in the city has increased from less than 1 percent of total trips in 1998 to 4.5 percent in 2015 and public transport has remained stable over the last 20 years. With steadily falling PM levels, Bogota’s air quality is improving, but the city has not yet achieved the WHO’s recommend level. Source: Dr. Nestor Rojas, National University of Colombia, with data form the Air Quality Monitoring Network, managed by the Secretary of Environment, Bogotá. In the near future, the city will need to finalize the implementation of the integrated public transport system, initiate new projects—like the first metro line—and expand and improve TransMilenio and the bike network. The goal of the 2010-2020 air decontamination plan is to achieve average concentrations below 20 µg/m3 of PM10 and less than 10 µg/m3 of PM2.5. Achieving this is possible, but will require continual work. Some cities facing air quality problems have resorted to extreme measures, like banning vehicles from circulation. These emergency measures can be useful in the short term, but they are ineffective in the medium and long term. Structural changes are needed, not just to improve air quality, but to meet people’s mobility needs. Cities need transport demand management (TDM) measures, like parking management and congestion charge, as well as more high-quality public transport and infrastructure for walking and cycling. Avoiding sprawl through compact, connected and coordinated urban development is also an important part of the equation, along with clean fuel technologies and emissions standards. Improving air quality is a matter of life and death. This blog continues the discussion on Air Quality in Global Cities at Connect Karo 2016, an annual conference organized by WRI India. To learn more, click here.